Whole wheat Pizza is a healthy alternative to refined flour/ Maida Pizza. It is gloriously delicious and the most wonderful thing about it is, you can serve it to your family without any remorse. Whole wheat Pizza is delightfully crunchy on the outside and soft and chewy on the inside. Only a little amount of refined flour is used to give Pizza a nice texture. I tried 100% whole wheat Pizza but it came out too much chewy. Adding little refined flour improves the texture and it still has all the goodness of whole wheat. You can bake this Pizza two ways. You can make the base well ahead and then spread your favorite toppings and bake again just before serving. This way, the toppings; especially the cheese remain perfect and not over baked. The other method is to make a thin base and spread all the toppings including cheese and bake it till done. Both take almost same time. I have tried both ways; while the former is a better option when you have guests or if you are serving later; the latter has a light crust and is great for quick bites. For toppings, I had some chicken, colorful bell peppers, onions and mushrooms. Add your own choice of favourite toppings. 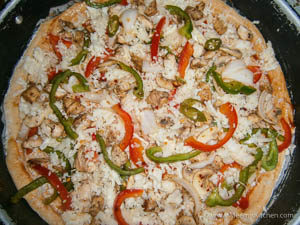 You may also check out my Vegetable Pizza recipe, made with refined flour; Paneer Pizza and Chicken Tikka Pizza. There is also Stuffed Garlic Bread (Dominos style), Soft Crescent rolls, Sausage Dinner rolls which are all great recipes. Chicken Kathi roll, Chicken Pasta, Healthy chicken wraps, Chicken cutlets, Thattukada style chicken fry, Tandoori chicken are all great chicken recipes. Whole wheat Pizza has more nutritional value and is a perfect and delicious weekend dinner idea for your family. Wishing you a great weekend in advance!! In a wide bowl, mix 3 cups whole wheat flour, ½ cup Maida and salt. Mix the yeast in ½ cup lukewarm milk and sugar. Keep aside, covered for few minutes for frothing. Pour the yeast mix to the flour and add enough lukewarm water to knead well. 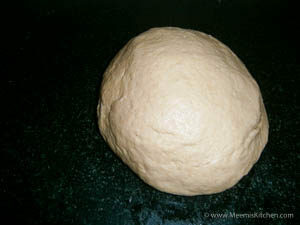 Once you get a sticky dough, transfer to a flat work surface. Spread half the olive oil in your hands and knead the dough. (If you are using a food processor, just knead for few minutes. I personally prefer kneading with hands as I am too lazy to take the processor out and hate the washing process afterwards!). 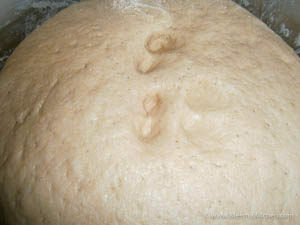 Pat the dough with the balance olive oil and keep it covered for 1 -2 hours or till it becomes double the size. Meanwhile, heat Butter in a pan, add the cooked chicken chunks (cook chicken pieces with salt, pepper powder and little water), add paprika powder or chili powder, Worcestershire sauce and fry for some time. Keep aside. 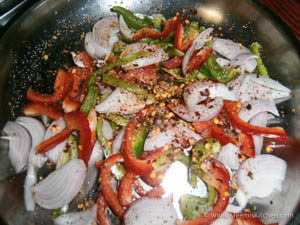 Dice the capsicum, onions and sprinkle oregano, chili flakes and salt. Divide the dough into 3 equal parts. 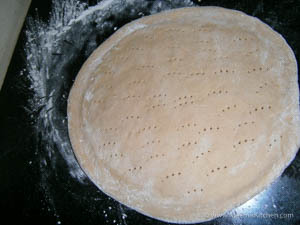 Sprinkle flour and pat/ pound one portion into a small disc. Now using your fingers make a small crust on the outside while you press the inside part with your palm. You can work on that to stretch and make a full round medium pizza. Poke with a fork to let out air bubbles. If you want to bake the Pizza base first, keep it aside for 10 minutes and then bake in the oven @ 180o c for 10 minutes. Then take out and arrange the toppings and bake again for 10 minutes. If you want to bake everything together, make a thinner crust and spread the pizza sauce (mix all ingredients for pizza sauce) on the base, then spread little cheese, chicken, mushrooms, veg mix, more cheese, oregano and keep aside for 10 minutes. Bake in a pre-heated oven @ 180 o C for 20 minutes or more. Take out and cut into triangles and serve hot. Enjoy! You can add your choice of toppings for the Pizza. I have used instant dry yeast in this recipe. If you are using dry yeast, add a pinch extra, mix with warm milk/ water and keep for rising. The water and milk used for mixing should be lukewarm. If it is too hot, yeast will die and it will spoil the texture. Poke the Pizza base with a fork. This is to prevent air bubbles while baking. Mozzarella cheese is good for Pizza. Always use a good brand of cheese. 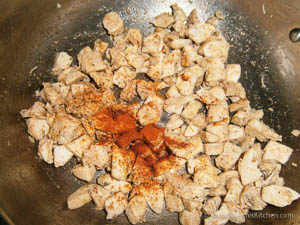 If you are adding Mushrooms, dice and fry them in little olive oil or butter with a sprinkle of salt. 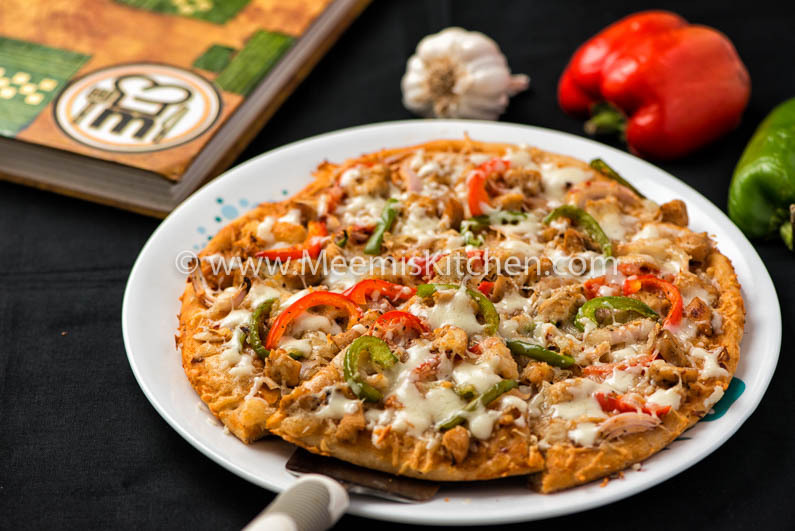 Try this wonderful healthy Chicken Whole Wheat Pizza. also try my Vegetable Pizza recipe. I would like to hear from you, if you like it. Comments from you would motivate me to bring you more delicious and wonderful homemade recipes. God Bless! !